I am absolutely stunned. After wondering for months about how serious Romney was on tackling illegal immigration and the strange endorsement of Tom Tancredo after dropping out of the race, Romney has issues the coup de grace. Mitt Romney has appointed Immigration Warrior Kris Kobach to his advisory staff. Who is Kris Kobach? Well you may remember Kris as the lead attorney in defending Hazleton, Pennsylvania‘s Illegal Immigration Relief Act. Kris has been a leader in the fight against illegal immigration in this country and his addition to the Romney team shows that he is deadly serious about ending illegal immigration.I’m telling you, I’m sitting here just absolutely stunned. That is how unforeseen this was to me. After this appointment, I see no way that I cannot at least support Romney’s immigration stance now. Before it was all words. As for Romney’s other positions, well that’s up to you to judge. 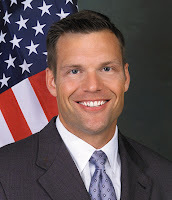 For those that are not familiar with Professor Kobach, he is a noted Immigration expert, Professor Of Law And Head Of The Kansas Republican Party.In 1996, Professor Kobach joined the University of Missouri – Kansas City School of Law (UMKC) faculty. In 2001, he was awarded a White House Fellowship serving in the office of U.S. Attorney General John Ashcroft. There he would serve as the Attorney General’s chief adviser on immigration law and border security. After the 9/11 terrorist attacks, Kobach was charged with the Department of Justice’s (DOJ) efforts to tighten border security and implement the National Security Entry-Exit Registration System. Before leaving DOJ in 2003, he led the reform of the immigration court system. Professor Kobach has litigated a number of high-profile immigration lawsuits including representing the city of Hazleton, Pennsylvania. He is a Senior Counsel at the Immigration Reform Law Institute. At the Law School, he teaches Constitutional law and immigration law. Contrast this with McCain’s disgusting appointment of Juan Hernandez as his Hispanic Outreach Director discovered a few days ago. For more on Kris Kobach read my extensive day by day coverage of the Hazleton trial from March 2007. Thanks to Matt Carden for the tip. Despite consistent polls showing that 70-80% of Americans want immigration laws enforced and the border secured, most 2008 Presidential hopefuls pay no attention to Americans at all. Candidates like Guiliani, Romney and McCain are nothing but “Retreads” parroting the tired Bush Party Line telling ad nauseum the hardships faced by illegal aliens living in the US, and insist on forcing amnesty for illegals on resisting Americans. Retreads carefully evade mentioning the damage done to middle and low-income Americans by the illegal alien invasion. (Yes Virginia, that’s what it really is–an invasion. The 5,000 illegal aliens daily breaking into the US equal a regiment, and each month it’s the equivalent of a field army. That’s more troops than we have in Iraq or that landed in Normandy on D-Day in 1944!). George Bush only spoke of “hope and opportunity” and didn’t mention the collapsing emergency rooms illegal aliens use for their FREE primary medical care, the public schools buckling to accommodate their children, or the increasing tax burden for illegal aliens forced on middle-income Americans who gain nothing from this illegal alien invasion. It’s an outrage that Retreads intentionally malign and defame American men and women whose only “offense” is publicly identifying and discussing the problem of illegal immigration as a historic national crisis. Retreads may fool themselves but they don’t deceive Americans. That’s why the average American voter is ecstatic that Congressmen Duncan Hunter, Ron Paul and Tom Tancredo have entered the 2008 Presidential race. They know these three statesmen will insist that the immigration issue (both legal and illegal) be recognized and addressed as a top issue in the Republican Party’s platform. Three cheers to Hunter, Paul and Tancredo! While on the surface it may appear that each side of the aisle has a different “master,” (Republicans serving global business’ demands for cheap labor vs. Democrats seeking the “cheap votes” from ethnic lobbies), the reality is that they’re both in bed together. Examination of donor lists of LULAC, MALDEF and other ethnic lobbies reveals the multi-national corporations who traditionally demand that Republicans deliver cheap labor. Retreads refuse to call the invaders what they are: illegal aliens. Instead, they choose diluted, politically-correct and pandering terms like “undocumented migrants” and “unauthorized workers.” Examples include Senator John McCain who “prefers the term illegal immigrant” (1) in precise lock-step with George Bush’s 2007 SOTU speech. Similar panderers abound on the opposite side of the aisle: Ted Kennedy, Hillary Clinton, John Edwards, John Kerry are Democratic Retreads who parrot the snake oil pitch that illegal aliens are valuable “citizens” of the US instead of the lawbreakers they are. Retread John McCain has legitimately earned his reputation for arrogance. While organizing and leading “congressional visiting teams” during the May 2006 Senatorial Amnesty passage, I personally saw the self-built shrine in his Phoenix district office lobby. Politicians often display photos of themselves with other important people to impress visitors, but not John McCain. One entire wall of the office lobby is covered floor-to-ceiling with framed magazine covers upon which McCain’s picture commands sole place on the cover! Voters don’t behave like that; they write primarily when they oppose a politician’s bills. Yet knowing that he’ll want the votes of each of the 100,000 Americans who wrote those letters and e-mails, “Godfather of Amnesty” McCain arrogantly continues to force illegal alien amnesty on Americans. Newspapers who copy and praise Retreads’ behavior should also be rejected as credible sources of accurate reporting. The brave few like Lou Dobbs who are marginalized by the ethnic and open borders lobbies are actually the only sources of what really happens and why. Nearly 8 months after the disgraceful conviction of two honest and brave Border Patrol agents for doing their job of intercepting an illegal alien drug smuggler, no national news network and few newspapers have reported the story the Bush Administration wants hushed up. Retreads pander to racism with membership in congressional caucuses geared to ethnic bias rather than ideology should be rejected as demagogues and worse. Examples are the Congressional Black Caucus, (Democratic) Hispanic Caucus and (Republican) Hispanic Caucus and the Congressional Asian Pacific American Caucus. That such organizations claim “being black is an unwritten rule” or admit non-Hispanics as “associate members” (translated second-class members) would provoke a firestorm of condemnation if practiced by “white” counterparts. Can you imagine a “Congressional Anglo-European Caucus” where Black, Hispanic or Asian member of Congress were “associate” instead of “full” status? The clear message sent by members of such caucus groups is “racism is OK so long as ‘whites’ are excluded” That It’s NOT OK must be shouted loud and clear by Americans–black, brown, red, white and yellow. Retreads’ calls for “civility” are no more than the “Can’t we all just get along?” cries of the liberal side of the open-borders lobby. Considering that such liberals established and perpetuate such ethnic caucus groups, the liberals have answered their own question–they don’t want to “get along” with anyone and their cries are both hypocriticals as well as whining and sniveling. Their “Can’t we all just get along?” brands them as crybabies. Reject “white” politicians who accommodate such racists by being “keynote speakers” at racist organizations, extolling racist agendas of groups like National Council of LaRaza, League of United Latin-American Citizens and the like. Again, such disgraceful behavior spans both sides of the aisle: George Bush, John McCain, Ted Kennedy, HIllary Clinton, John Kerry and many others whose lack of integrity or ethnics allow them to obsequiously seek votes at any pandering price. Americans have had enough of illegal aliens being given our economic and natural resources while “Retread” politicians send the bill to law-abiding citizens. The President and Congress who have refused to enforce our immigration laws are responsible for the overpopulation and urban sprawl that bankrupts every law-abiding American citizen and legal immigrant. These politicians give “cheap labor” to big business and send the subsidy bill to taxpayers. 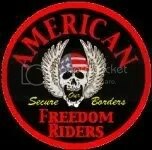 Americans have a country to save. Let’s roll! S. J. Miller is a former veteran of the IT industry who sought another career rather than “follow the jobs” abroad, and a lifelong resident of border states, California, Texas, Arizona, and Nevada.